3D Kanojo: Real Girl Anime Season 2 Announced: Anime series has occupied an illustrious position in the world of animation. It is not utterly surprising that the anime had won the interests of zillions of hearts and fortunately, have been inevitably pursuing so ever since. The Japanese manga series “3D konojo girl” was written by ” Mao Nanami” and later the series were compiled into 12 volumes and published. “The Hoods entertainment” has undertaken the task of the adaptation of the manga series into anime TV series bearing the title “Real girl”, directed by takashi naoya, being aired on anicho networks from April 4 to June 20, 2018. The series commences from the persepective of the male protagonist, hiraku tsustsui, who is socially forsaken, too tenacious to extract his happiness from manga reads, video games, anime series. His vague and gross nature thus helped him nothing much except he managed to have no dear friends leaving alone yuto ito, who is very much believed to be an otaku and possibly his only bestie . After all it is so difficult to predict that he is irresistibly unbearable to his friends because of his long lost connection to virtual world, henceforth underlining his desperation untoward 2D universe. Owing to the circumstances, he is sentenced with the punishment of pool cleaning, where he is destined to get acquainted with a girl namely ” iroha irakashi”, our female protagonist and so called “real girl”. Iroha is often disliked by many girls for her refutable attitude and also bears a reputation for dating boys of many a number. As hiraku is not particularly too keen on girls and iroha is known for rumours that never ends on her part, he is determined to sworn off iroha with out giving a room for any acquaintance. As usual, fate might have other plans. After a couple of encounters, hiraku goes on a date with Iroha, as per the request from her side. Although he is reluctant at first, where Ito convinced him for his unreasonable behavior. It’s not been so long since, they blossom into a couple honoring their relationship taking it a bit further as assumed as much as love. 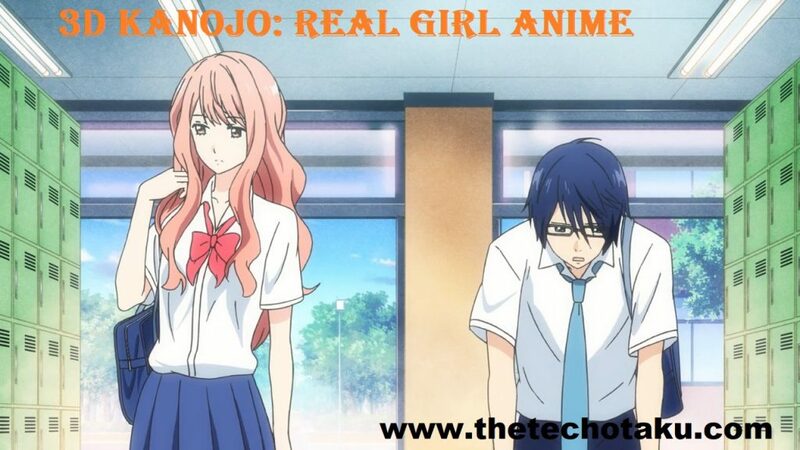 In 3D Kanojo: Real Girl Anime Season 2 plot you will see some extra characters. Then, there is an arrival of mitsuya takanashi, popular for his riches and have had an infatuation on iroha and for obvious reasons, it gives birth to jealousy on hiraku . In order to sidetrack his relationship with iroha, mitsuya manages to manipulate his little sister anzo who contemplates to develop a situation of hiraku kidnapping her. Although mitsuya is partially successful in his lousy attempt, he fails to grab the attention of iroha. However mitsuya is not that capable of holding a secret for so long and is forced to sum up his endeavours after a row of detestable arguments. Thus hiraku gets rid of burden of afflictions but that doesn’t help him deny the rumours all the way around the school. The clash rises between iroha and hiraku, where he unintentionally complains his lack of trust on her, their perpetual understanding and questions why she chooses him over mitsuya. Here it leads to path of misguided conflicts and the couple are upset with each other. Simultaneously, Hiraku’s friend Ito, unable to compromise with his stubborn behaviour, keeps a distance from his friend, therefore, leaving our hero all alone. His loneliness is no longer a considerable pain after the introduction of sumie ayado. Oblivious of the fact that sumie has a crush on hiraku, he finds solace in her company but not everyone who sees them together don’t want to consider it as a friendship. Meanwhile, hiraku need not have to make an appreciable effort to break the ice with his girl friend, iroha and bestie, Ito. Iroha finds it extremely uncomfortable in the presence of ayado who is welcomed into the friends circle of hiraku, despite her already complicated relationship. Other way around, Ito falls for ayado except he is not confident enough to confess his love. One fine morning, the whole gang of friends heads out to a picnic spot in woods, where ayado readily admits to iroha that she has fallen head over heels in love with hiraku. On contributing to put forward the directly admitted feelings of ayado to hiraku, he gets frustrated and yells at her for being so self centred and her absurd thinking. This left the fully agonised iroha to run away from the spot, except that she too is unaware of the destination where she has been running into.